This is the final installment in the series about this statue. See also part one and part two. Even with the decision to send a duplicate of Saint-Gaudens' statue to London finalized, the Taft family, who had commissioned Barnard's work, had other plans. The Tafts decided to offer a second casting of this monument to another English city, Manchester. Believing that an image of a "rough-hewn" man would fit well in that working-class city, and that it would be an appropriate location for a gift after it had supported the Union cause during the Civil War, (even during the cotton shortage that hurt local textile mills), Manchester accepted the gift. According to Adam I.P. Smith's article, a Manchester newspaper opined: "London, in posessing the St. Gaudens statue, will have Lincoln the President; Manchester has Lincoln the man." British author H.S. 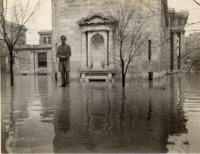 Perris thought highly of Lincoln and believed Barnard's statue would benefit humanity while giving the English people "a great lesson in Democracy," but even this was was not acceptable to at least one newspaper writer who preferred a figure of the "statesman" who had freed the slaves, who lived large in history and who should be remembered instead of the "awkward, stumbling" individual presented by Barnard. Manchester displayed this new monument in Platt Fields but when it was moved to the central section of the city, near what is now known as "Lincoln Square" in 1986, controversy arose when some of the text on it he statue's base, taken from a Lincoln letter to Manchester, was changed to say "working people" in place of "working men." Another copy of Barnard's statue eventually arrived in Louisville, Kentucky, where it was called "gloriously ugly and at the same time touchingly pathetic." That phrase apparently came from someone who liked the monument. In his book, Percoco compliments Barnard's creation, but states: "Yet I think the right call was made in sending the duplicate cast of the Saint-Gaudens cast to London. I have seen that, too, and in that particular space, Barnard's Lincoln would have looked very out of place. Lincoln the statesman is to be preferred on the international stage as our exportable image (emphasis is mine) for another nation's capital." Even now, questions about Lincoln's image (and, thus, memory) still exist. Was he the Lincoln of "The Prairie Years" or of "The War Years?" Is one truly better than, or preferable to, the other? Does context matter? Who decides? In cases like this, should an artist use his/her interpretation of a figure, or try to gauge what the potential audience wants? Can these answers change over time? i have not seen Saint-Gaudens' work, nor its location in London, but to me, it appears Barnard accomplished his personal artistic goals, even while not matching the expectations of much of the audience. His statue shows what appears to be a normal man, not a super-hero, in a fairly normal-looking stance, not someone striking a pose for a portrait or to project a grandiose image. To me, it is neither an overly romantic representation of its subject nor an insult to his memory. 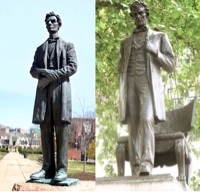 Perhaps placing Lincoln's hands by his side or behind his back may have made the statue look more natural, but if Barnard made a mistake, it may have been more in his choice to portray the younger Lincoln than in the execution of his vision. Even if his final product does not show a "statesman-like" figure, it remains a plain, honest rendering of an American icon, a rendering whose story is as fascinating as the statue itself.